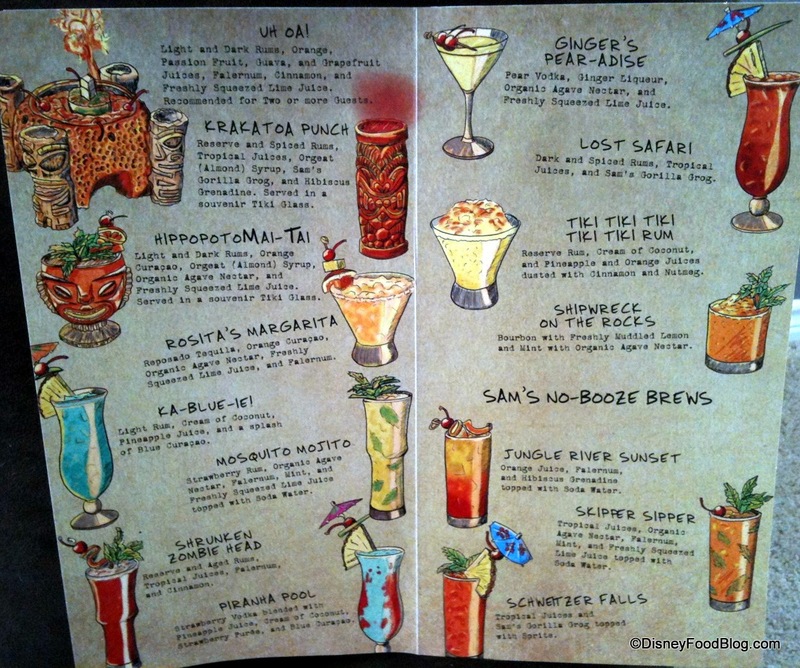 Is Trader Sam’s Enchanted Tiki Bar in the mix for the re-imagined Downtown Disney? Rumors were swirling even before the official announcement March 14 about the planned massive renovation of the Downtown Disney shopping and entertainment district at Disney World in Lake Buena Vista, near Orlando. The multi-year expansion, expected to begin in April, will be the largest in Downtown Disney history. When it’s completed in 2016 (and perhaps earlier), the area will become known as Disney Springs, themed after a Florida waterfront town that sprang up in the 19th century. The back story will draw on both Disney and Florida history. Walt Disney’s parents were married in 1888 in Central Florida, an area replete with natural springs. The online Disney community is abuzz about the plans, which also include major design and structural changes to the 120-acre lakefront site that will allow it to grow from 75 to more than 150 shopping, dining and entertainment venues. Images that feature logos of potential tenants leaked out on the WDW Magic message board, fueling the excitement about high-end retailers and new themed restaurants. Click here, here and here for more on the leaked images. WDW News Today also published leaked concept art. But there’s one possible new venue that holds special interest to tikiphiles and old-school Disney fans alike. 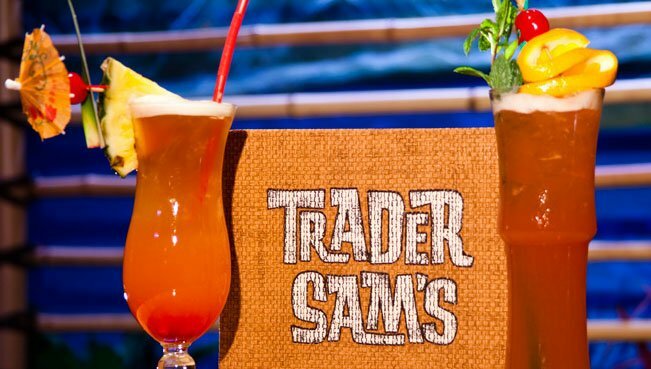 While we’re excited about the overall expansion and potential revival of what was the once-thriving Pleasure Island bar and restaurant district, we’re ecstatic about the possibility of Disney opening its second location of Trader Sam’s Enchanted Tiki Bar. Much care was put into making sure Trader Sam’s was an authentic Tiki bar. Disney artists such as Kevin Kidney and Jody Daily, who have close ties to the Tiki scene, were part of the design team. And famed carver Leroy Schmaltz of Oceanic Arts created the front doors. The music is an authentic mix of exotica and traditional South Seas tunes. Like everything at Disney’s parks, there’s a story behind Trader Sam, whom you may spot on the Jungle Cruise. The hundreds of items covering the walls are souvenirs from Sam’s adventures and contain the same sight and word gags associated with that attraction as well as the Adventurer’s Club, which featured a cast of characters that entertained guests in both scripted bits and improv. Trader Sam’s follows that model in that its bartenders and servers are part of the “show,” keeping the atmosphere fun and friendly (and corny), much like the Jungle Cruise skippers. Disney’s Imagineers also added their trademark interactive touch. The bar features many surprises and special effects triggered by ordering specific drinks, such as an erupting volcano, a sinking ship, and bar stools that move. We’ve heard that the drinks are surprisingly good and feature ingredients such as hand-crafted syrups from B.G. Reynolds. Of course, the drink names fit the theme with HippopotoMai-Tai, Schweitzer Falls and Tiki Tiki Tiki Tiki Tiki Rum among the offerings. Click here to see the menu. There has been hope that Trader Sam’s would eventually find its way into the sprawling Polynesian Resort, the iconic luxury hotel built on the shore of Seven Seas Lagoon across from the Magic Kingdom park in 1971 and one of Disney World’s landmarks. But a location at Disney Springs would certainly make it easily accessible to more than just Walk Disney World guests. Plans call for Disney Springs to keep Downtown Disney’s free admission and free parking policies. It could certainly fit into the area’s water theme, perhaps skewed a bit more toward Sam’s adventures in turn-of-the-century Florida. 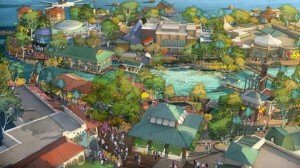 Disney Springs will include four outdoor “neighborhoods” connected by a flowing spring and vibrant lakefront. Fans of the Adventurer’s Club are eagerly awaiting further details, hoping for more than just a tribute to the nightclub that was styled after a private club for world travelers and explorers in the 1930s. Could the Disney Springs version of Trader Sam’s also include some of the old cast performing in a dinner show? Hopefully the same warehouse that yielded many of the Adventurer’s Club artifacts in the Anaheim Trader Sam’s is still loaded with treasures. It will be interesting to see if and how this develops. It’s unclear from the concept art if it would take over the old Adventurer’s Club location. The current Pleasure Island area may become part of the Town Center in the proposed plan, featuring an upscale mix of shopping and dining along with a relaxing promenade. 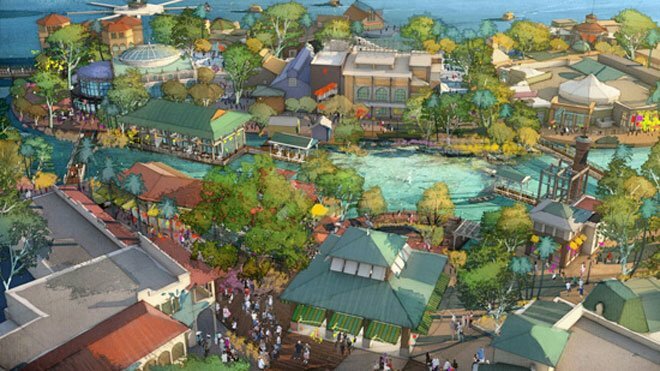 The bars and restaurants would likely be centered in what is proposed as The Landing, an area with waterfront views and themed dining. The east and west ends of the complex will see less upheaval but will still undergo major changes, such as the addition of parking garages and a pedestrian walkway across the lake on the east-side Marketplace area. 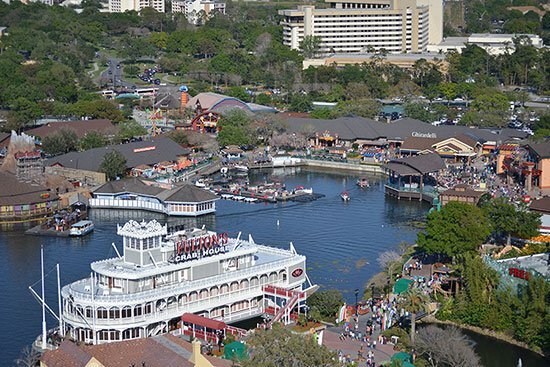 Major venues and attractions such as Cirque du Soleil, the House of Blues, the AMC theaters, the new Splitsville bowling complex, Fulton’s Crab House riverboat restaurant, and the Characters in Flight balloon ride are expected to remain where they are. Other current favorites include several Wolfgang Puck restaurants, a Ghirardelli ice cream shop, Bongos Cuban Cafè, T-Rex Cafe, the Paradiso 37 and Portobello restaurants, and a host of shops, galleries and smaller eateries. 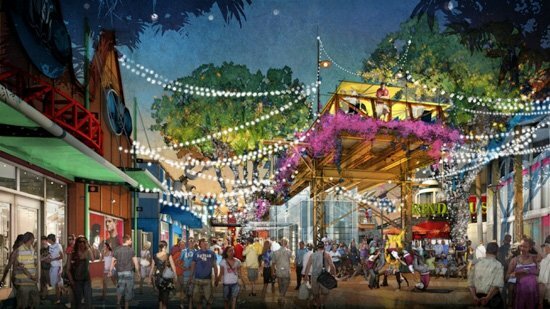 Other major design features of Disney Springs include a new grand entrance with a signature water tower, and an elevated area themed like an old rail track that is rumored to be the future home of an adult-oriented nightlife district. There are conflicting reports on the future of the much-maligned Planet Hollywood location. One rumor has The Edison, one of the premier nightclub concepts in Los Angeles, taking over the globe-shaped building. But others predict it will take over the old Mannequin’s dance club space, with Planet Hollywood becoming a restaurant called The Observatory, complete with an astronomy theme. According to Orlando blog The Daily City, The Observatory is a new concept from Planet Hollywood founder Robert Earl, who last April launched the Planet Dailies restaurant and Mixology 101 lounge. The latter’s artisanal cocktail menu was created by celebrated London bartender Salvatore Calabrese. Planet Dailies is rumored to be coming to another Orlando location, but there’s another Disney Springs connection, according to The Daily City blogger Ken Storey. The Los Angeles development that includes Mixology 101, The Grove, is a possible inspiration for Disney Springs (along with its sister development, The Americana at Brand in Glendale), Storey wrote. (Interesting side note: The Grove is adjacent to the historic Farmers Market that was the inspiration for the Sunset Ranch Market area of Disney’s Hollywood Studios.) There’s more: Elkus Manfredi Architects, rumored to be working on Disney Springs, also developed not only The Grove and The Americana at Brand, but also Disneyland’s Downtown Disney in Anaheim. The leaked documents of Disney Springs bear a striking resemblance to those projects. And, of course, Disneyland’s Downtown Disney is just a stone’s throw away from Trader Sam’s. One more California connection: In January, Disneyland Resort President George A. Kalogridis, who oversaw the transformation of Disney California Adventure, replaced Meg Crofton as president of the Walt Disney World Resort. This move puts him in perfect position to oversee the metamorphosis of Walt Disney World’s Downtown Disney. Joining Kalogridis is Kathy Mangum, the executive producer at Walt Disney Imagineering in charge of the development of the new Cars Land in Disney California Adventure. After leaving Radiator Springs, she’s now driving the creative team at Disney Springs. Meanwhile, foodies will have a lot to look forward to if all goes according to the leaked documents. Disney’s recent attention to the latest hot culinary trends (as seen at the Epcot International Food and Wine Festival and at many of the resort’s restaurants) will continue with what appears to be a new relationship with the Food Network. There are also some Disney-branded eateries on the drawing board. * A Food Network restaurant, which for years has been rumored to be going into Pleasure Island. * A restaurant featuring the talents of Food Network’s acclaimed Iron Chef Masaharu Morimoto. 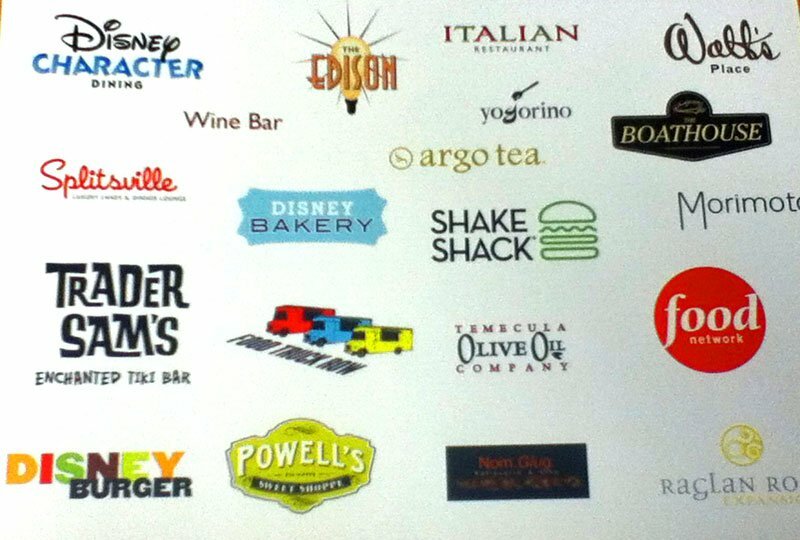 A leaked image showing logos of potential bar and restaurant concepts at Disney Springs. * An expansion of Raglan Road, the already massive Irish pub located in the center of Downtown Disney. * Shake Shack, a high-quality, fast-casual brand that has multiple outlets in the Northeast in addition to South Beach, Coral Gables and Boca Raton (coming this spring). * Disney may also partner or take ownership of a “food truck row” featuring specially branded vehicles. A “mystery client” has rush-ordered 10 “highly themed” food trucks from one of Orlando’s main food-truck builders, according to TheDailyCity.com. * A “World of Coca-Cola” attraction is also rumored to be on the drawing board, possibly replacing the DisneyQuest “indoor theme park” area, according to speculation on The Daily City. * There may also be Disney-themed restaurants such as “Disney Burger,” a bakery, a character dining spot, plus an intriguing establishment simply called “Walt’s Place.” Speculation includes this being either a new concept or a version of “Walt’s,” a fine-dining restaurant in Disneyland Paris. Here’s one new possibility to add to the rumor mill: Perhaps Imagineers will resurrect the “Walt’s Attic” concept that was originally intended for Disney’s BoardWalk resort next to Epcot. The area above the Jellyrolls nightclub that’s now used by Disney Vacation Club members and wedding parties was originally designed to be a restaurant that would document Walt Disney’s life in the 1920s and ’30s with historic memorabilia from the Disney archives. With all the other plans in the works, it’s just as viable as any. Downtown Disney and Pleasure Island debuted in 1995. The area was previously known as the Disney Village Marketplace since 1989. It was created in 1975 as Lake Buena Vista Shopping Village. * Downtown Disney transition to include food trucks? * Downtown Disney to go head-to-head with Mall at Millenia and outlet malls? * Major changes in store for Disney’s Polynesian Resort? This entry was posted in Culture, Disney Springs, Disney World, History, Restaurants and tagged Adventurer's Club, cocktails, Disney Springs, Disney World, Disneyland, Downtown Disney, Enchanted Tiki Room, Jungle Cruise, Pleasure Island, Trader Sam's, Walt Disney World. Bookmark the permalink. 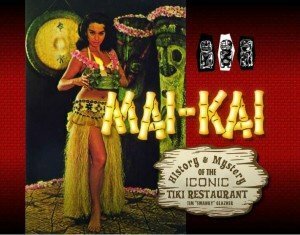 1 Response to Is Trader Sam’s Enchanted Tiki Bar in the mix for the re-imagined Downtown Disney?